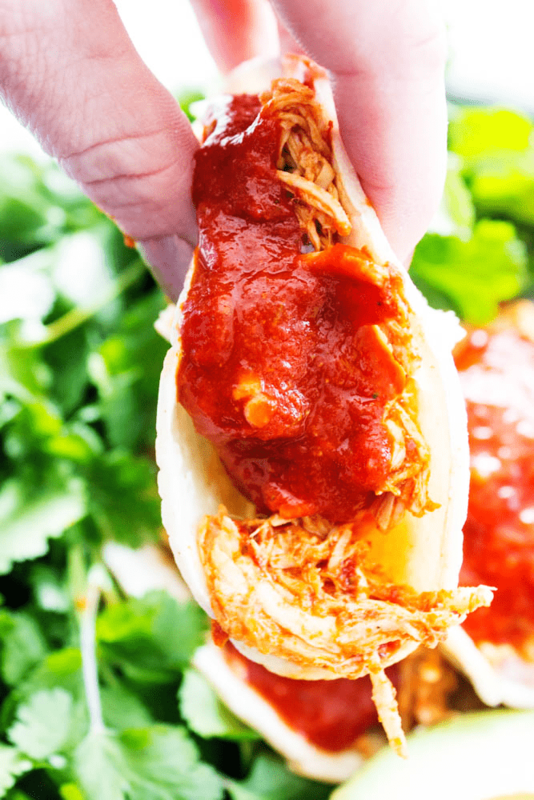 Recipe for CHILE COLORADO SLOW COOKER CHICKEN is full of flavor and insanely delicious. A versatile recipe to make tacos, burritos or enchiladas. Just looking at the pictures again of this slow cooker chicken recipe has me salivating. I completely love this chicken recipe with the chile colorado sauce. It is hands down my kids favorite sauce on the planet. Jersey even said this week it was better than salsa and that is the biggest compliment. Jersey has been asking me to make my Colorado Chile Sauce for a few weeks now and finally during spring break I got the chance. This chile colorado sauce recipe is literally hands down the best sauce for taco, burritos or enchiladas. Now with that said, this sauce is okay to cook with, it made this slow cooker chicken moist and flavorful but you will want some extra to top your meal with because that is where it elevates from good to amazing. I decided to go with tacos, because then everyone could dish this up as they wanted. I made up a quick taco bar just with lettuce, cheese, diced cherry tomatoes, avocados and of course chile colorado sauce. The only thing that was similar in our tacos is that all of them were drenched in the chile colorado sauce. My son Madden, our very picky eater even devours this sauce. The only warning I have about this chile colorado sauce is that you want to make sure to get the mild peppers are the store and not the hot, because dang people these can be very hot peppers. My hubby likes the heat but the rest of us can’t handle it. Another little tip to make this chile colorado recipe is that you will find the dried red peppers in the Mexican section at your grocery store. Usually right next to the seasonings. My husband says this is his favorite thing I make. I have mixed emotions about that because this recipe is so simple. So while half of me feels like his favorite item from my blog should be something a little more complicated. The other half of me is so excited that it is so easy to make, because I could literally impress him every day with this recipe for chile colorado sauce. This week we are having my son Madden’s family birthday dinner and he has requested Beef Enchiladas with Colorado Chile Sauce. Yum! I’m excited to be able to make this for him and I know my family won’t mind have this sauce again. 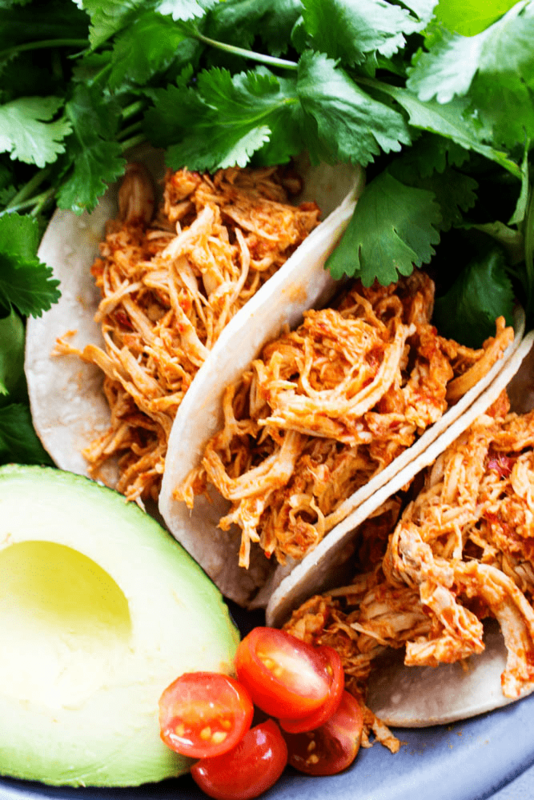 This recipe for slow cooker chicken, literally is so easy and stunning to serve. With vibrant colors from the sauce, then with the toppings you serve it with this is one beautiful dish; that is incredibly tasty as well. Win, win! 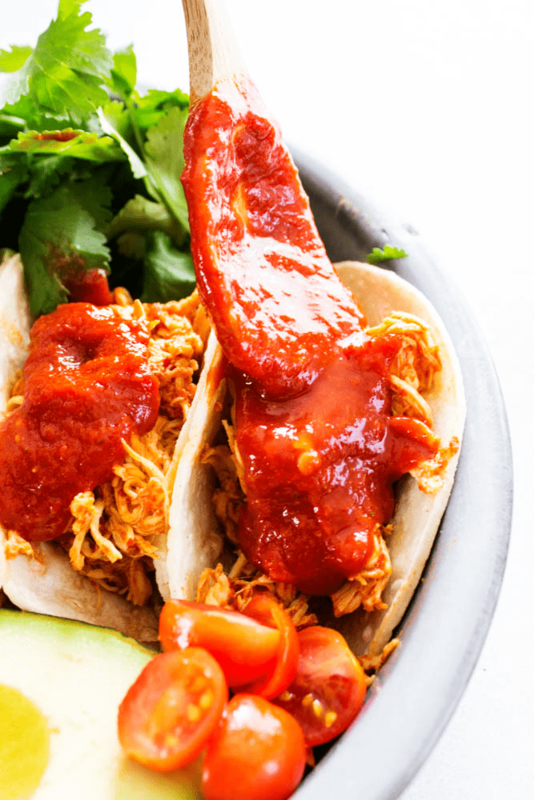 I’m excited friends for you to try this recipe for CHILE COLORADO SLOW COOKER CHICKEN and take my advice make extra sauce, in fact double the sauce recipe – you won’t regret it. How do you make slow cooker chicken? Place to chicken breast, seasonings and 2 cups Chile Colorado sauce into the slow cooker and cook on high for 2-3 hours or low for 4-6. 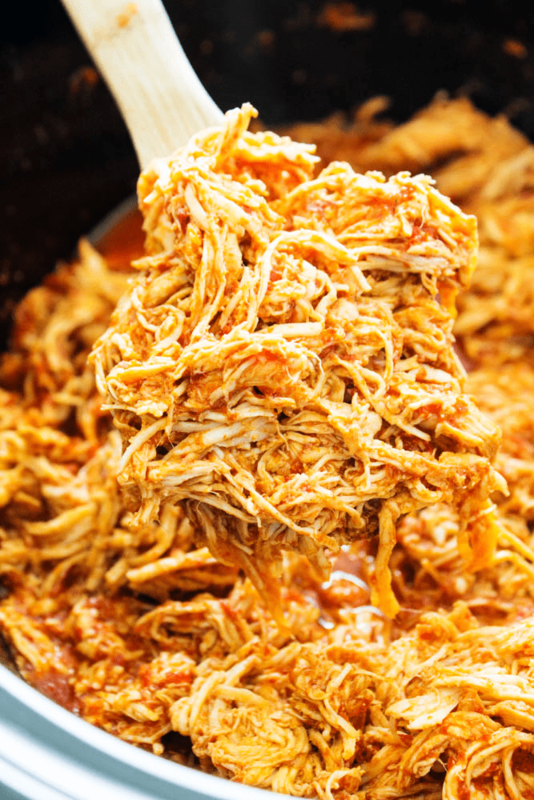 Add shredded chicken back into the slow cooker and stir to combine. Serve chicken with corn or flour tortillas, chips or on a salad. Serve with remaining Chile Colorado Sauce. Soups, dips, dinners, even desserts! 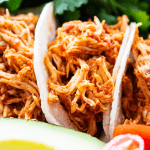 CHILE COLORADO SLOW COOKER CHICKEN is full of flavor and insanely delicious. A versatile recipe to make tacos, burritos or enchiladas. Make Chile Colorado Sauce. Instructions here. From this recipe, there will be one cup of sauce left over. 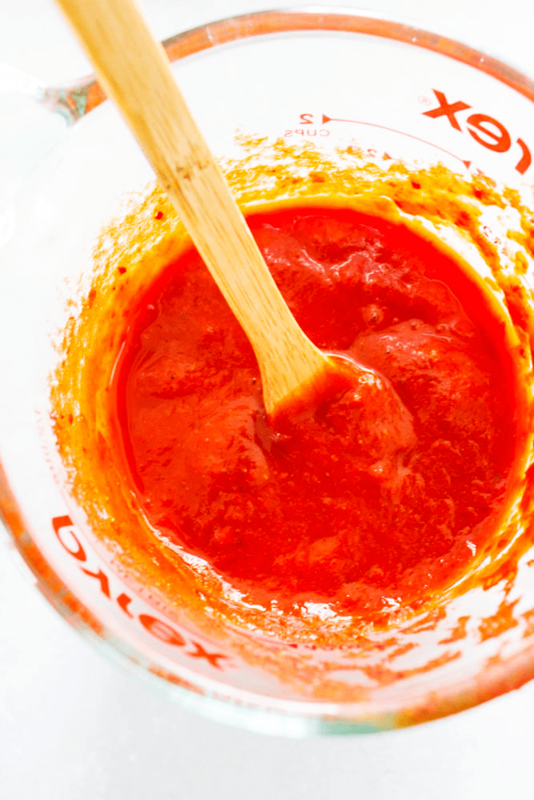 If you want additional sauce for topping, as a salsa or enchilada sauce, double the recipe. Remove chicken from slow cooker and shred. 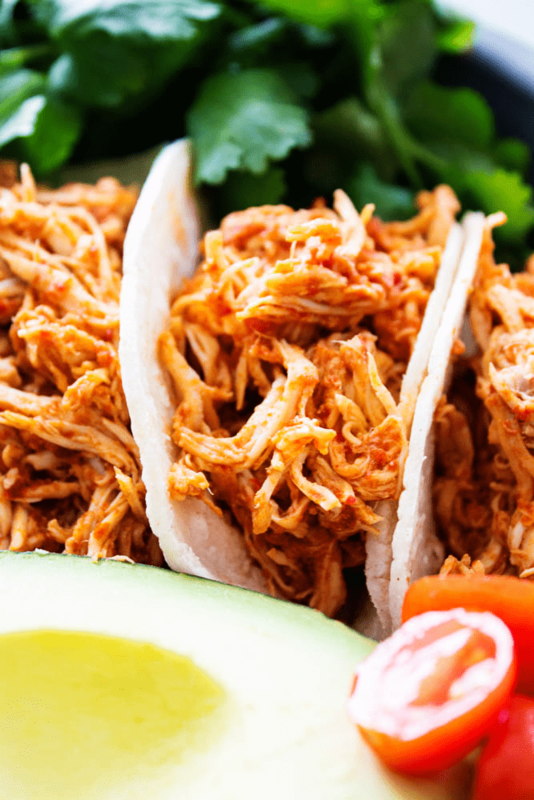 Add shredded chicken back into the slow cooker and stir to combine. Serve chicken with corn or flour tortillas, chips or on a salad. Serve with remaining Chile Colorado Sauce. That looks scrumptious and I’m craving a couple of those tacos right now! If it were up to me, I would have tacos every day! Adding this to my menu plan! I would too! I hope you enjoy! My slow cooker is my BFF when it comes to getting dinner on the table. Can’t wait to try this for next week!! Looks delicious! This chicken looks so good! I have to try it out! These look like a great way to change up taco night! I can see how this would be a favorite with those flavors!! Sounds delicious! Is there anything better than tacos?? These look AMAZING! Lol, I’m so glad you like the recipe, enjoy!